At least three battalions of the Quds Forces, the elite overseas branch of the Guards, were deployed support the fight against the Islamic State of Iraq and al-Sham, an offshoot of al Qaeda that is swiftly conquering territory across Iraq, they said. One Guards unit that was already in Iraq fought alongside the Iraqi army, offering guerrilla warfare advice and tactics that helped reclaim most of the city of Tikrit on Thursday. Two Guards’ units, deployed from Iran’s western border provinces on Wednesday, were tasked with protecting Baghdad and the holy Shiite cities of Karbala and Najaf, these security sources said. 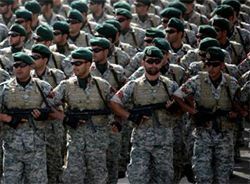 The QUDS are the overseas branch of Iran's Revolutionary Guard. ISIS has reportedly seized a huge cache of U.S. military equipment. The Washington Post reports Iraq is falling apart, splintering into three factions: Shiite, Sunni and Kurdish. The Kurds have taken Kirkuk, ISIS is moving south towards Baghdad, and the Shiite-led government of Nouri al-Maliki is reduced to calling for volunteers and some help from Iran. Has Obama's position changed? The Post quotes him as saying, “It’s fair to say . . . there will be some short-term things that need to be done militarily." Warning: Don't look at these photos if you are squeamish about death by hanging. That didn't take long. On its Twitter account, the State Department posted this alert tonight -- its first tweet in four days. The U.S. government assesses that this Iranian-backed plan to assassinate the Saudi Ambassador may indicate a more aggressive focus by the Iranian Government on terrorist activity against diplomats from certain countries, to include possible attacks in the United States. Background on the plot is in our earlier post here. Iranians Charged With Plot to Kill Saudi Ambassador in U.S. The case, called Operation Red Coalition, began in May when an Iranian-American from Corpus Christi, Texas, approached a US informant seeking the help of a Mexican drug cartel to assassinate the Saudi ambassador, according to counter-terrorism officials. The Iranian-American thought he was dealing with a member of a Mexican drug organisation, according to documents. Opposition websites said Revolutionary Guards and basiji militiamen were stationed everywhere and that they moved swiftly and violently to break up opposition demonstrations. They claimed the security forces used live ammunition, knives, teargas and paintballs that would enable them to identify protesters later and that they were beating and arresting women as well as men. They were backed up by water canon, new Chinese anti-riot vehicles and helicopters. Some, wearing plain clothes, infiltrated the protesters. The mobile telephone, internet and text messaging systems were seriously disrupted. The best way to follow the Iran protests today, at least for now, is on twitter. Try #iranelection. While many are posting in Farsi, others are retweeting in English. Crowds are growing, and security forces opened fire. Security forces attacked the crowd of protesters in Arya-Shahr, opening fire on them. Several people have reportedly been injured during the shooting. However, the crowd has not dispersed and keeps chanting slogans. Security forces are firing directly on the masses of protesters. There is a heavy presence of military and intelligence forces in Tehran streets. Other tweets: "Clashes in Vesal St & Vanak sq right now." "Confirmed: Mobile service disconnected in certain parts of Tehran." Very ugly reports are coming out about the treatment of detainees in Iran after the election. Some prisoners say they watched fellow detainees being beaten to death by guards, in overcrowded, stinking holding pens. Others said they had their fingernails ripped off, or were forced to lick filthy toilet bowls. ....More bruised corpses have been returned to families in recent days, and some hospital officials told human rights workers they have seen evidence that well over 100 protesters have been killed since the elections. The article contains links to the sites where you can read the personal stories. The Times says some of the sites have been reliable in the past. There are reports of brutal assaults on protesters in Tehran. There are eyewitness reports of people being thrown off bridges. “I see many people with broken arms, legs, heads — blood everywhere — pepper gas like war,” the source said. Around “500 thugs” with clubs came out of a mosque and attacked people in the square, another source said. The security forces were “”beating women madly” and “killing people like hell,” the source said. Best way to follow the updates live is on Twitter. Try #Tehran, #IranElection. HuffPo is live-blogging information. and CNN is on it as well. Via Newsweek: One of their reporters in Iran has been taken from his home by security officers. Among the dozens of people arrested overnight in Tehran was NEWSWEEK reporter Maziar Bahari, who has covered Iran for the magazine for over a decade. Bahari was home asleep at 7 a.m. when several security officers showed up at his Tehran apartment. According to his mother, who lives with the 41-year-old reporter and documentary filmmaker, the men did not identify themselves. They seized Bahari's laptop and several videotapes. Assuring her that he would be their guest, they then left with Bahari. He has not been heard from since. Reporters Without Borders says more than 20 Iranian journalists and bloggers have been detained since last week's elections. "War, children, is just a shot away." Cell phone service around Tehran is currently down. Clashes have erupted. Telephone communication between Tehran and the rest of Iran has been completely disconnected. This corresponds with the beginnings of the arrests of the opposition. It is suspected that this is being orchestrated by the son of Mojtaba Khamenei son of The Supreme Leader, Ali. CliffLyon at Daily Kos is following the breaking developments.